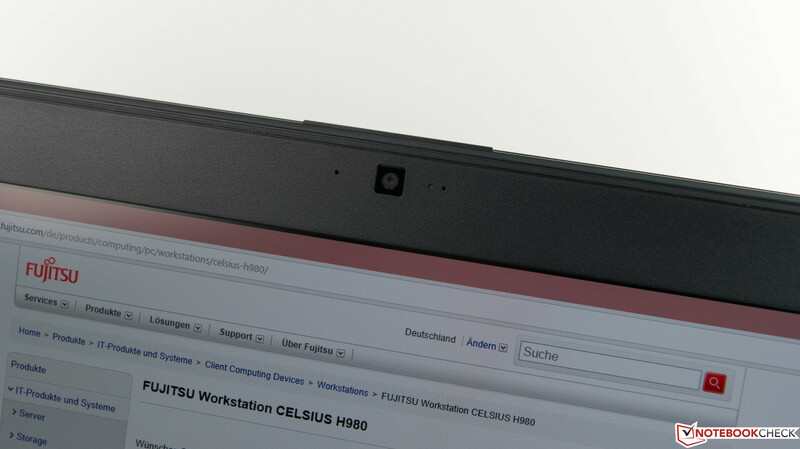 The Fujitsu Celsius H980 is a 17-inch workstation that succeeds the Celsius H970, which we reviewed around 18 months ago. Fujitsu is not leaving the workstation market without a fight, but Dell, HP and Lenovo have become serious opponents and sell decent workstations. 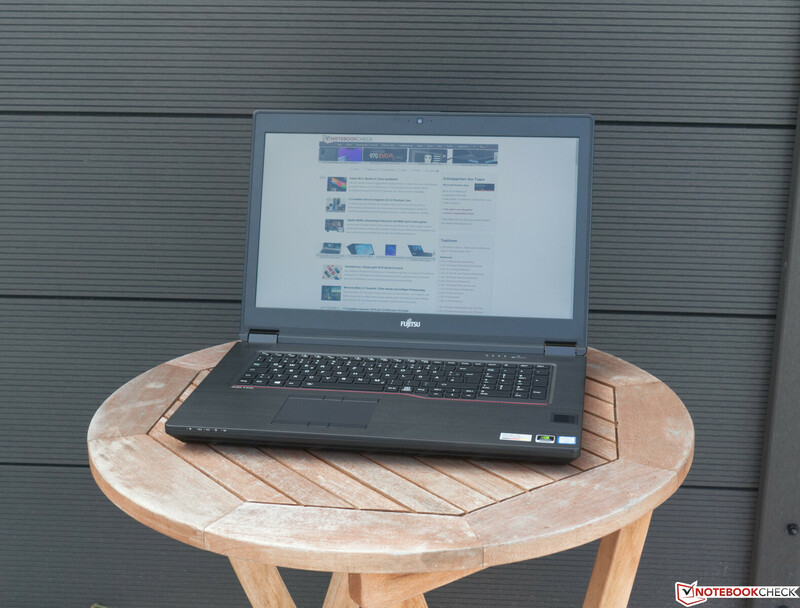 There are numerous configurations of the H980, but our review unit is one of the cheaper models, which the Japanese manufacturer has equipped with an Intel Core i7-8750H processor, an NVIDIA Quadro P3200 GPU, 16 GB of RAM and a 512 GB SSD. This configuration officially retails for €3,899 (~$4,427), but we found that prices have already dropped to around €3,500 (~$3,974) online. 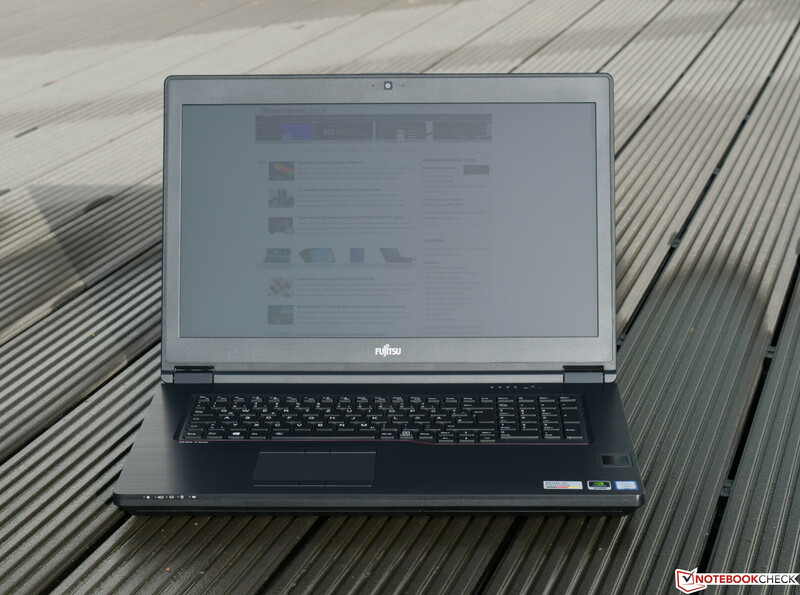 Fujitsu also sells variants with just 8 GB of RAM and a 5,400 RPM SATA III HDD, but we would recommend avoiding these models. The limited RAM and slow drive will make the device feel slow, and it may struggle with resource-intensive tasks too. 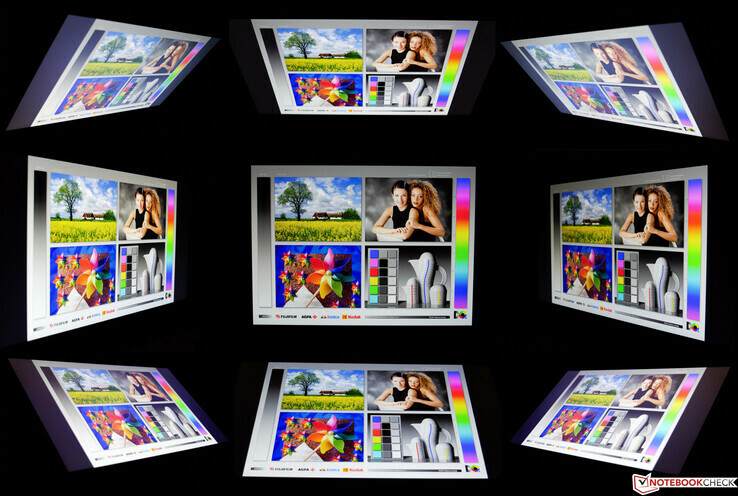 The company also sells more powerful configurations should you need more performance than our review unit offers. The H980 can also be configured with either an Intel Xeon E-2186M or a Core i7-8850H processor and a Quadro P4200 or Quadro P5200 GPU. Moreover, please see the Fujitsu datasheet for a full list of the optional components with which the H980 can be configured. The most expensive configuration currently costs around €6,700 (~$7,608), which comes with an Xeon E-2186M CPU, a Quadro P5200 GPU, 64 GB of ECC RAM and a 1 TB SSD. 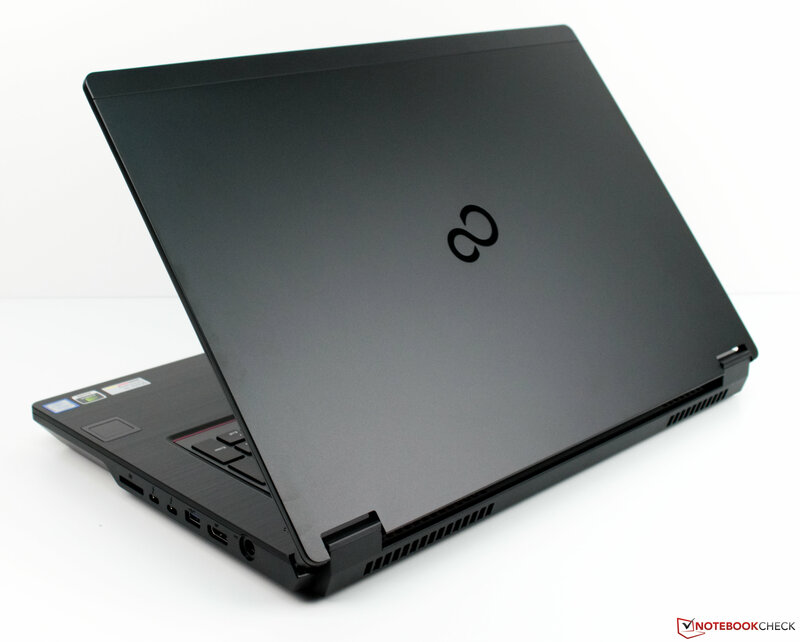 We have chosen to compare the H980 against other comparably priced workstations. 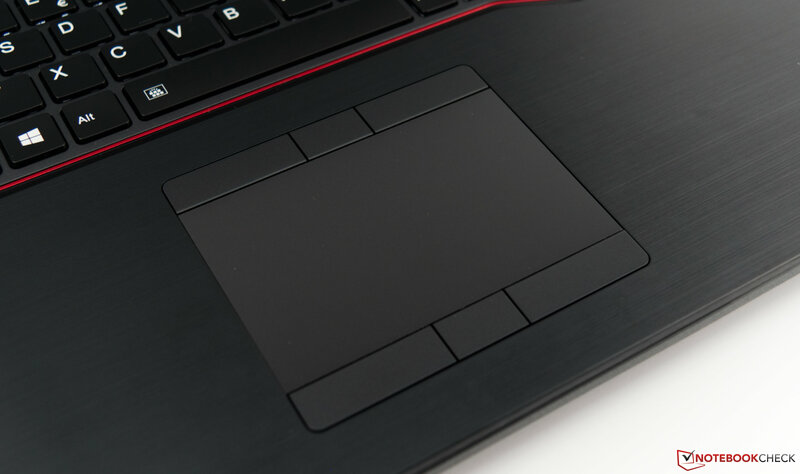 Our comparison devices will include the Dell Precision 7720, the HP ZBook 17 G5, the Lenovo ThinkPad P72 and the Fujitsu Celsius H970. The H980 has the same case as its predecessor, so we point you to our Celsius H970 review for our views on this area. Fujitsu has made changes internally though, which we will cover in the Maintenance section of this review. 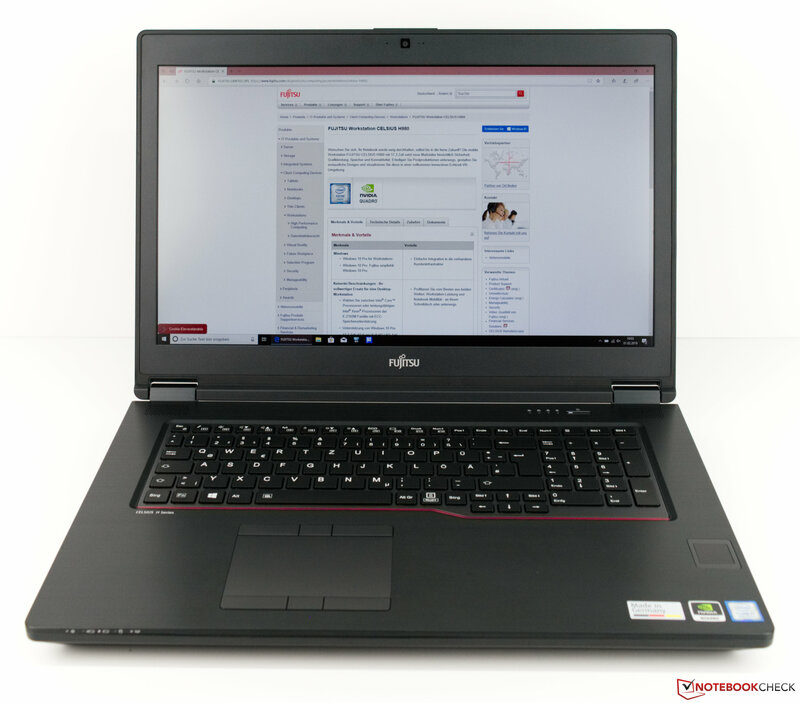 Fujitsu has equipped our review unit with an Intel Dual Band Wireless-AC 9560 modem, which supports all modern Wi-Fi standards and Bluetooth 5.0. There is also an RJ45 LAN port should you need a wired internet connection, but we would have liked to test its WWAN connectivity. 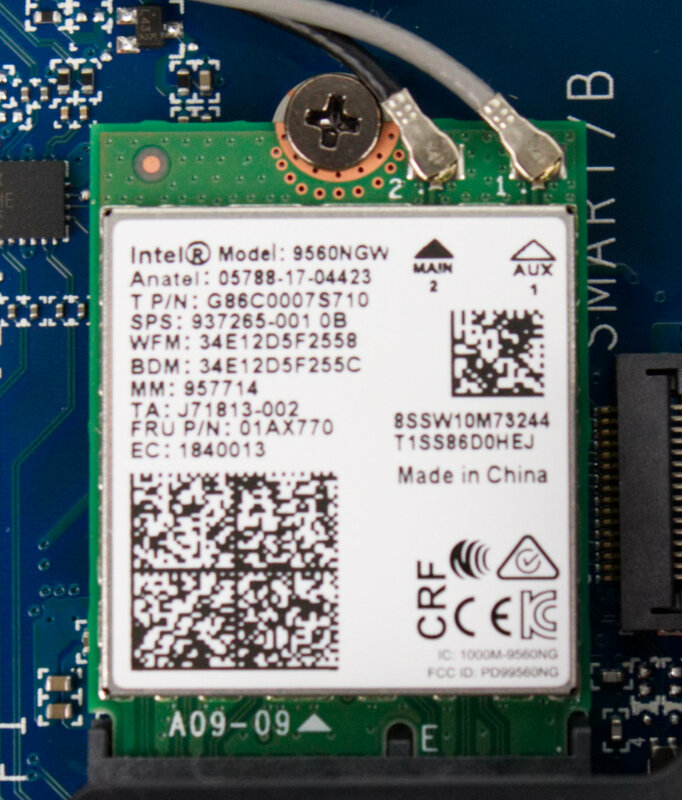 Unfortunately, the company did not include a WWAN modem in our test device, so we cannot comment on the H980’s WWAN capabilities. 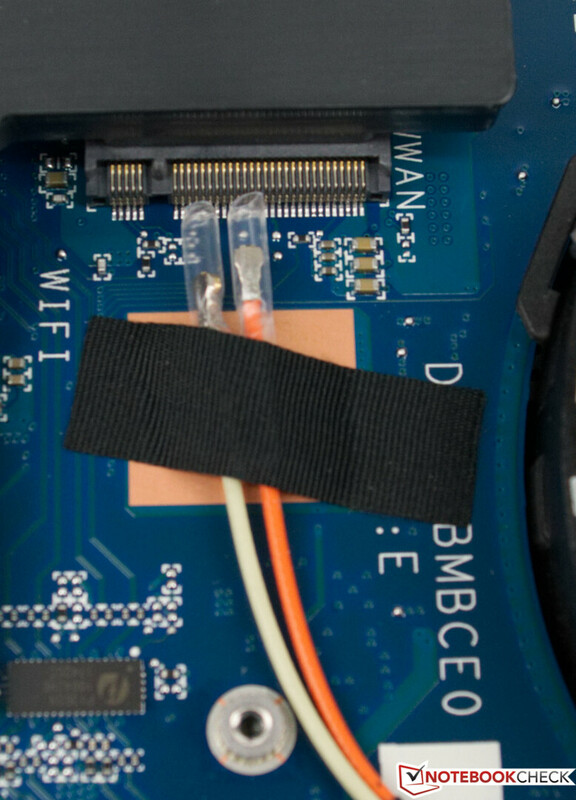 The antennas are pre-installed though, so you could easily add WWAN capabilities should you need it. 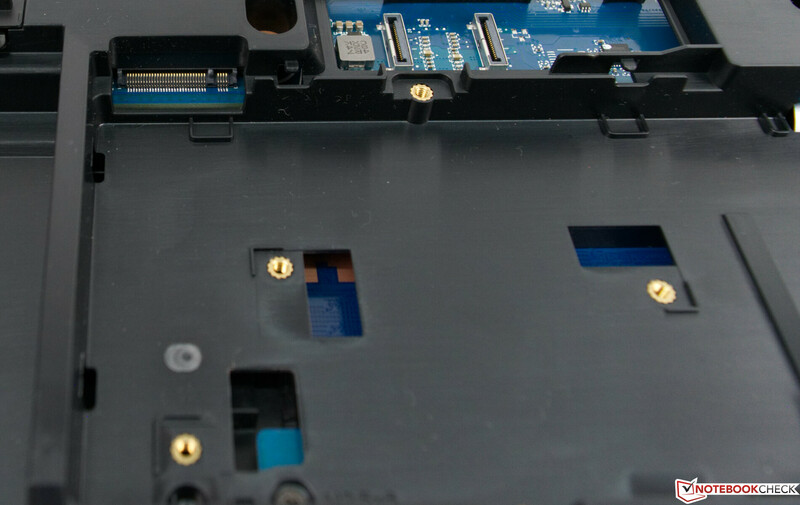 The corresponding SIM slot is located underneath the removable battery, for reference. 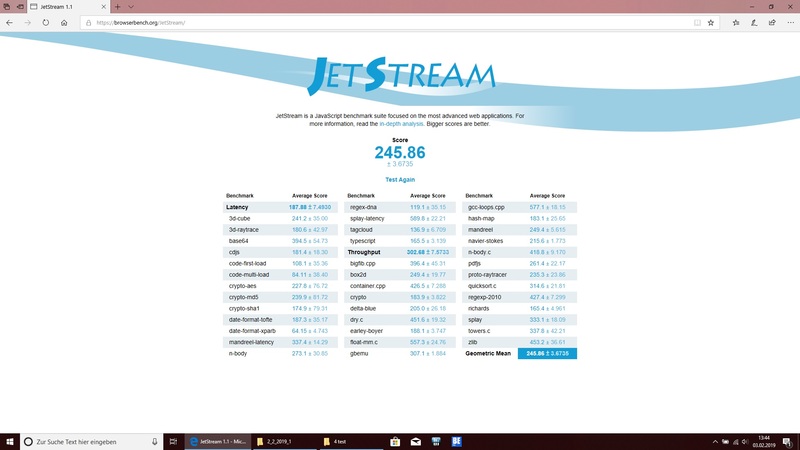 Our test device performed well in our iperf3 Client Wi-Fi tests and averaged over 650 MBit/s in both tests that we conducted. The H980 finished top of our receive comparison table and second in the transmission comparison table, but it is well ahead of the class average in both tests. The H980 is trickier to repair and maintain than it initially looks. The battery is removable, and Fujitsu has included a maintenance cover, which is good to see, but it only provides access to two SO-DIMM slots. Accessing any other components requires removing the bottom plate, but thankfully this is simple to do. 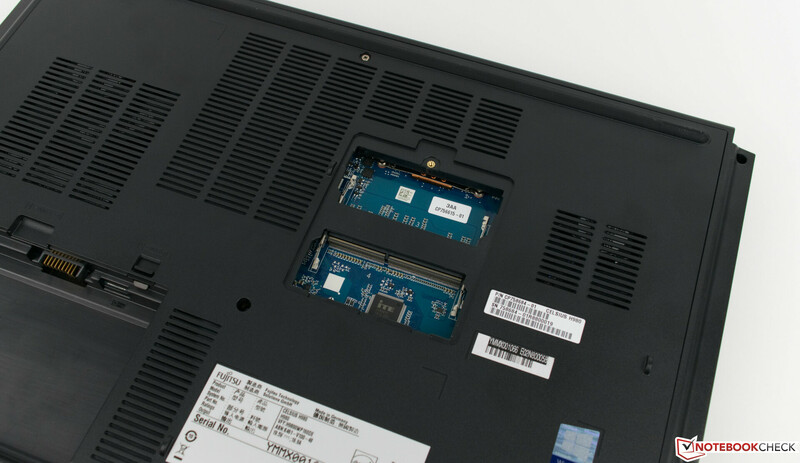 The motherboard has two M.2 2280 and 2.5-inch drive bays, which are easily accessible, as are the WWAN slot, the fans and the heatsinks. 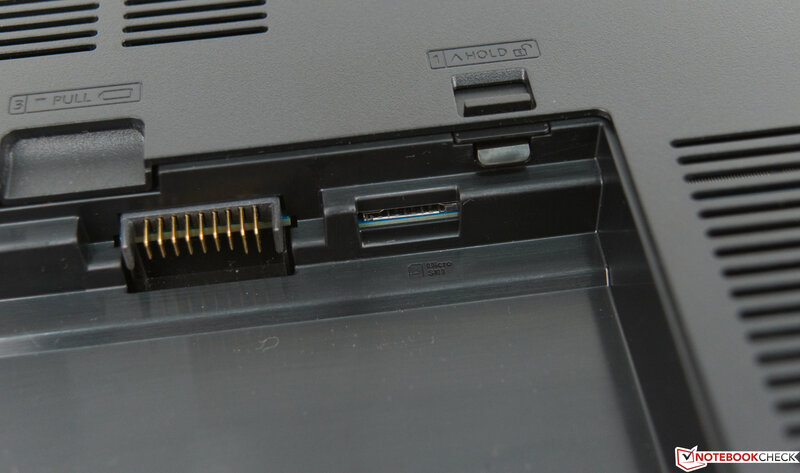 However, Fujitsu hides two other SO-DIMM slots on the reverse side of the motherboard, which means that you must remove, flip it over before you can access them. This is an arduous task as it requires removing all the components, which increases the risk of breaking something. Switching RAM modules should not be this difficult or time-consuming. The H980 and H970 are both equipped with 17.3-inch IPS displays that operate natively at 1,080p and have a pixel density of 127 PPI. 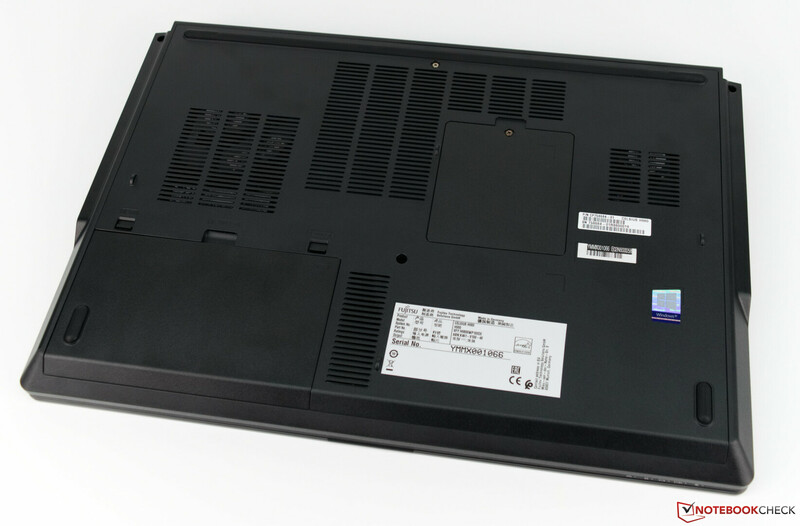 Fujitsu has equipped the latter with an older LG Phillips panel, and so their values differ. The display model number for our review unit is LP173WF4-SPF5, for reference, while the H970 has the older LP173WF4-SPF3. There are no alternative displays, which is disappointing as other OEMs have 4K options, as Dell does with its Precision 7720. 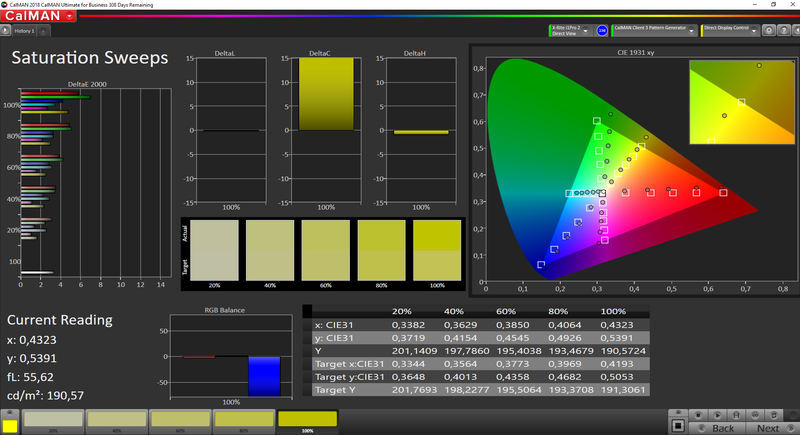 Our test device achieves an average maximum brightness of 394 cd/m², which is around 9% brighter than the display in the H970 and puts the H980 in the midfield of our comparison table. The Precision 7720 gets even brighter, but it is less evenly lit so large blocks of colour will look more homogenous on the H980 than they will on the Precision 7720. 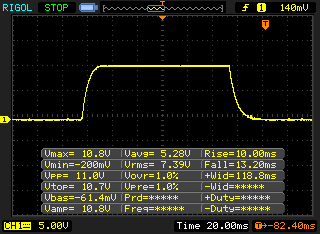 However, our review unit has a comparatively high black value, which we measure at 0.51 cd/m². 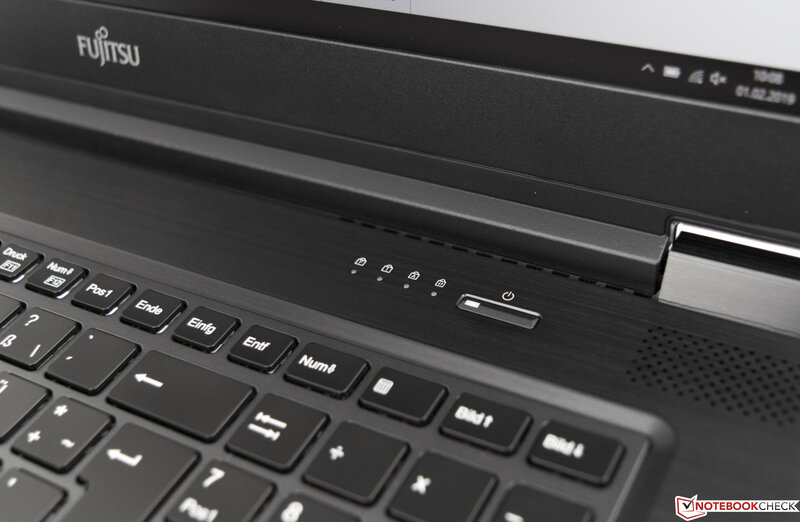 By contrast, the H970 has a 0.3 cd/m² black value, while the ThinkPad P72 and ZBook 17 G5 are better still at 0.28 cd/m² and 0.22 cd/m² respectively. 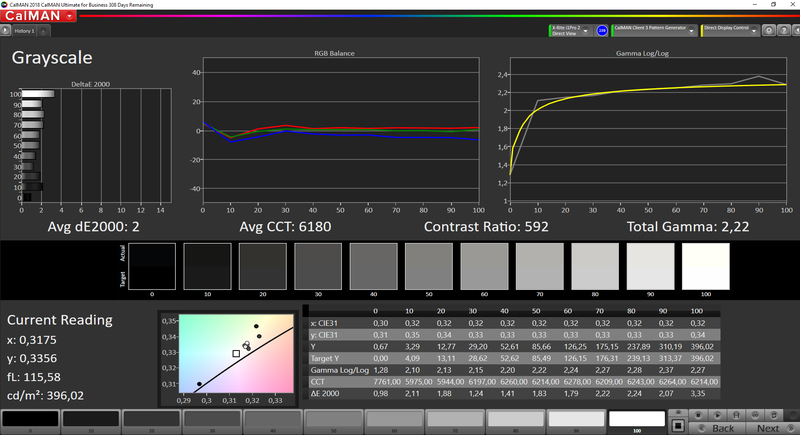 This means that black tones will look deeper on our comparison devices than they will on the H980, and it also impacts the contrast ratio, which we measure at 784:1 on our test device. 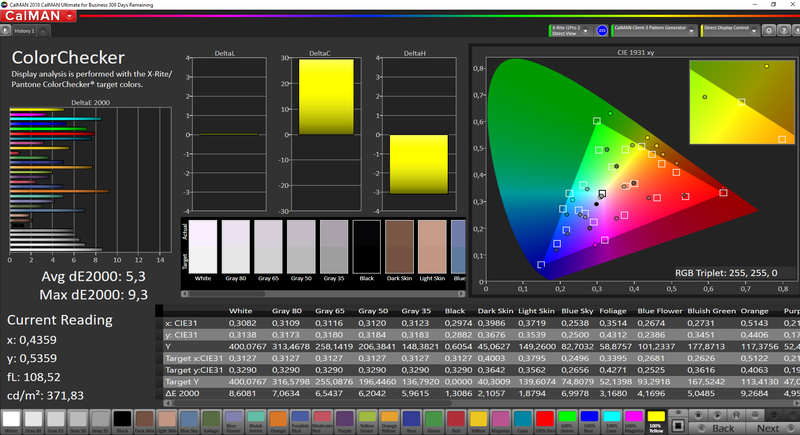 This is poor for such an expensive workstation, and all our comparison devices have considerably more vibrant displays. 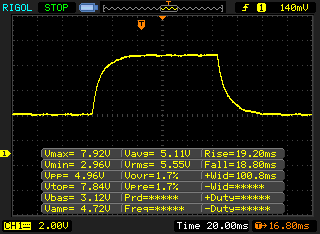 On the positive side, our review unit suffers from practically no backlight bleeding. Moreover, while it uses pulse-width modulation (PWM) to regulate its screen brightness, the frequency at which it does so is so high that it should not affect most people even if they are PWM sensitive. 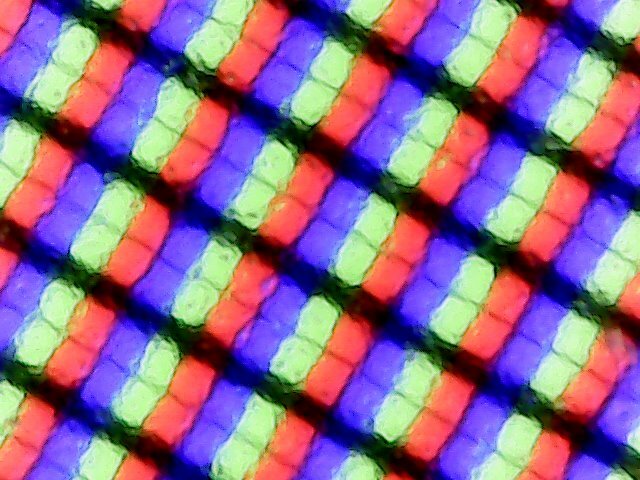 We should point out that our test device does have a stuck pixel, which is visible in our backlight bleed photo. We hardly noticed it in daily use though and we suspect that it is an isolated issue with this device. Hence, we have not factored the matter into our scores for the H980’s display. 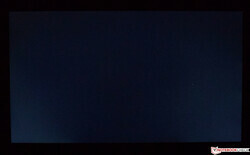 Colours look comparatively pale because of the screen’s low contrast ratio, but it did not look washed out in our view. We would have expected Fujitsu to have equipped the H980 with a higher quality display though, which should have also been pre-calibrated. Our review unit had too high Delta E 2000 deviations upon delivery for a workstation, but we were able to improve these by calibrating the display noticeably. We have included our calibrated ICC profile in the box above our comparison table should you wish to apply it, but please only use it with a display matching the model number of the one in our device. Otherwise, our ICC profile may worsen colour accuracy rather than improve it. 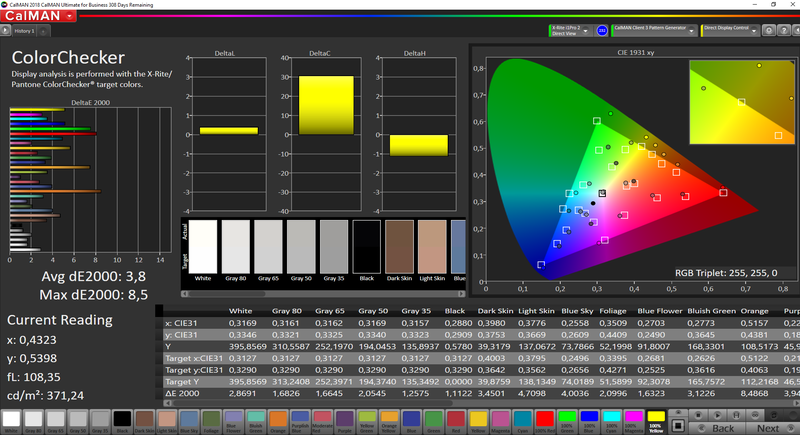 The H980 also has poor colour space coverage for a workstation, with just 84.9% sRGB and 55.8% AdobeRGB coverage. 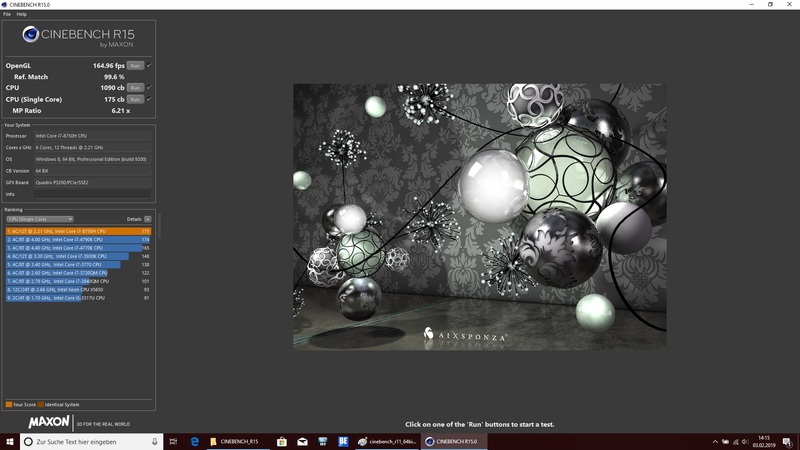 We also criticised the H970 for the same shortcomings that make both devices unsuitable for professional image or video editing unless you use an external monitor. The H980 is easy to use outdoors thanks to its bright matte display. We found that the screen remained readable in sunlight, but you may struggle in the summer under direct sunlight, so we would recommend finding a shady spot where possible. 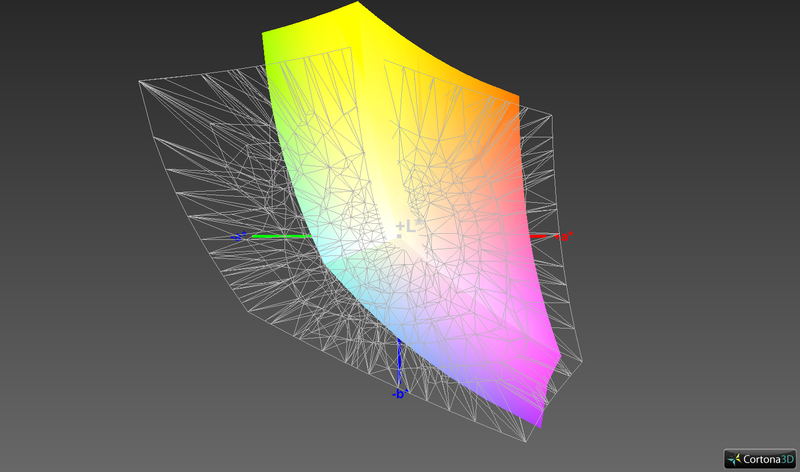 Our test device has good viewing angles too. 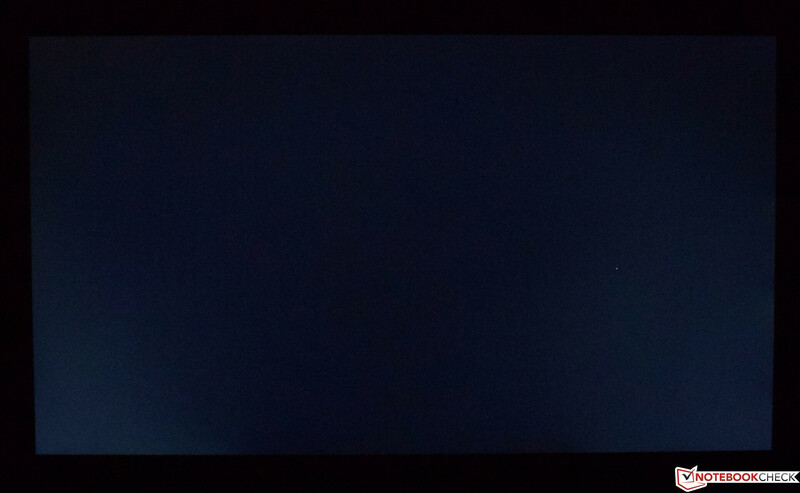 Our test image remains readable from practically every angle, although the top left- and right-hand images show that the contrast levels drop off at certain angles. Overall, you should have no issues with being able to read the H980’s display in daily use. The H980 has three CPU and GPU options, as mentioned at the start of this review. The Xeon E-2186M is a true workstation processor, but the Core i7-8750H and Core i7-8850H should still comfortably handle professional applications. 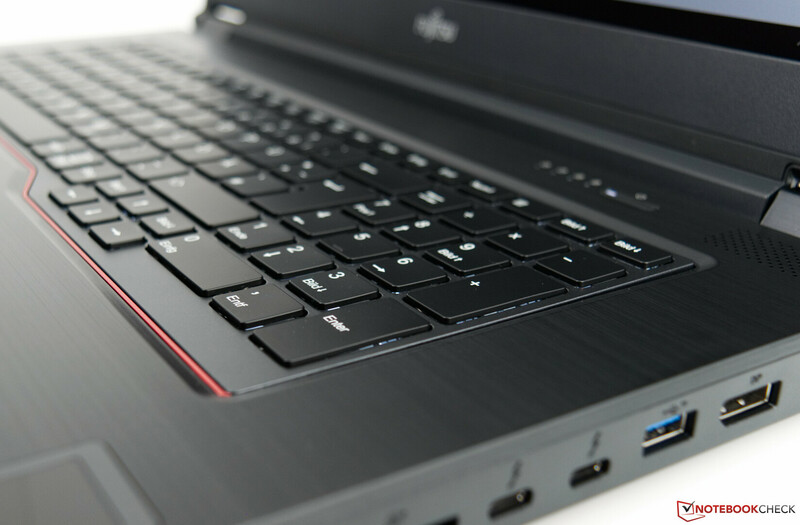 Equally, Fujitsu only equips the H980 with workstation GPUs, which can be complemented with up to 64 GB of RAM and a 1 TB SSD. 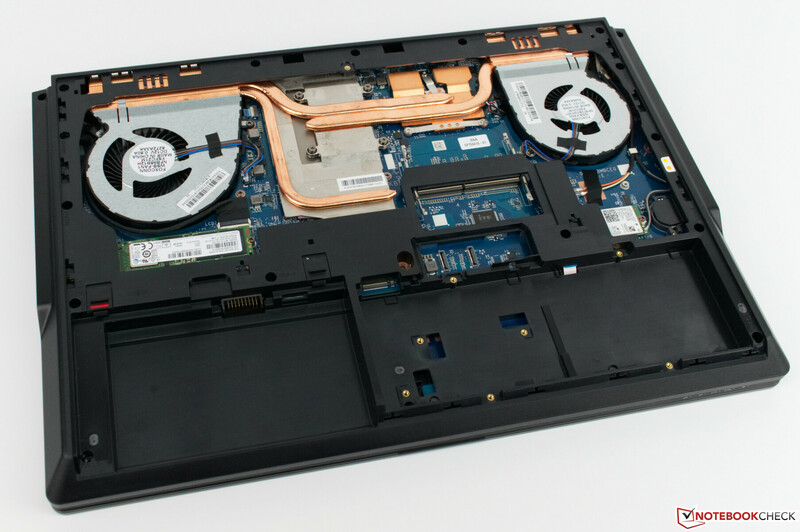 Our test device’s configuration should be powerful enough for most tasks though, while its RAM and storage are upgradable, which we have covered in greater detail in our Maintenance section. 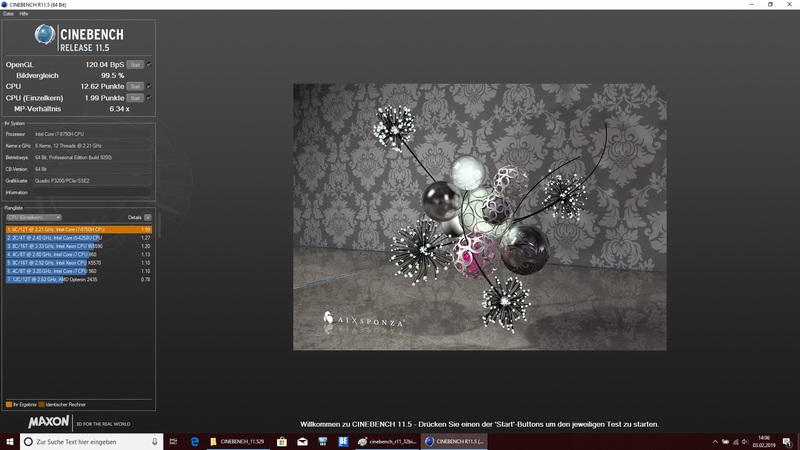 The Core i7-8750H is a hexa-core processor that has a 2.2 GHz base clock, which it can increase up to 4.1 GHz across two cores and 3.9 GHz across all cores thanks to Intel Turbo Boost technology. The CPU has a 45-W thermal design power (TDP) that the system can increase to 90 W for up to 28 seconds to achieve peak boost clock speeds. The Core i7-8750H also supports Intel Hyper-Threading, which allows the CPU to execute up to 12 threads simultaneously. The CPU in our test device performed on par with what we have come to expect from the Core i7-8750H. The H980 scored 1,090 points in the Cinebench R15 Multi 64Bit benchmark, which is 1% below average for its CPU, but is over 20% more than our Xeon E3-1535M v6 powered comparison devices and 33% more than the class average. 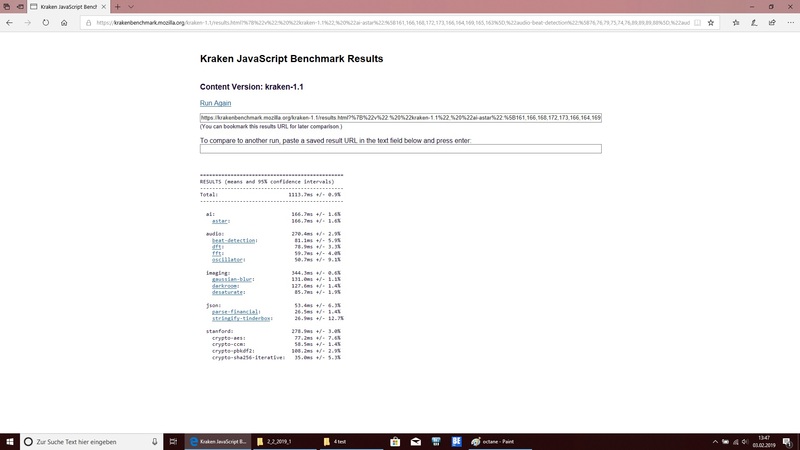 The Core i7-8750H scores approximately 33% lower than the Core i9-9900K, while it is between 8% and 13% slower than the Core i7-8850H. 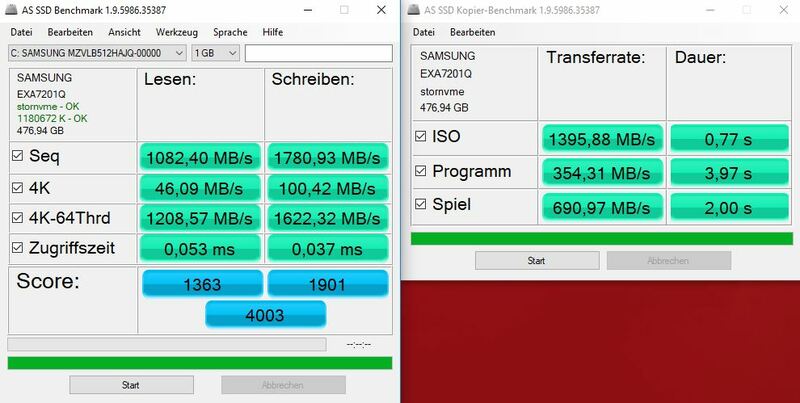 Our comparison table is much tighter in the CB R15 Single 64Bit benchmark though, with there being only a 7% gap between the Core i7-8850H and the Xeon E3-1535M v6. However, the Core i9-9900K opens an 18% lead over the Core i7-8750H, but the H980 and H970 only finished 2% apart. We also subjected our review unit to a looped CB R15 Multi 64Bit benchmark to determine how it manages its CPU performance under sustained load. In short, we were pleasantly surprised, particularly compared to the erratic performance of the H970. The H980 initially scored 1,058 points, which dropped to a minimum of 1,026 points by around the 20th benchmark pass through. 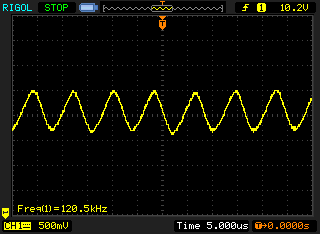 Our test device then averaged around 1,034 points for the remainder of the loop. Overall, the CB R15 scores fluctuated by just over 1% after the first benchmark run through, which does not represent thermal throttling. The slight reduction in scores that the H980 initially scored correspond to the system only being able to utilise the CPU’s 90-W peak TDP for 28 seconds. Please see our CPU benchmarks page for more information on the Core i7-8750H and other CPUs. 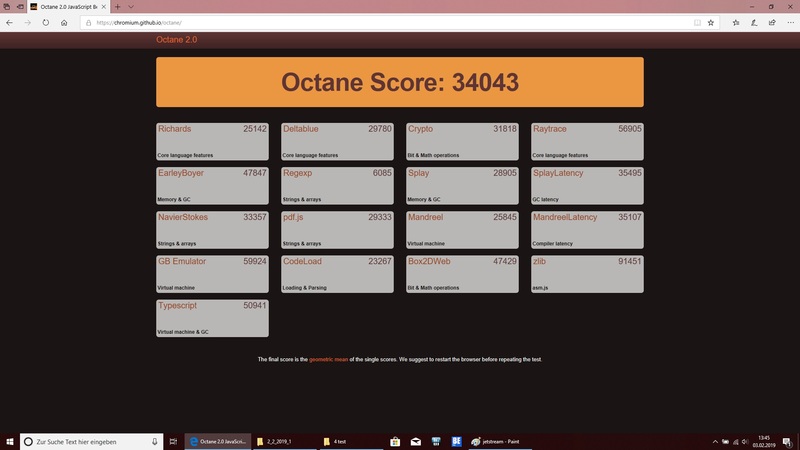 The H980 performed well in PCMark benchmarks too, and demonstrated that good system performance is more than just CPU power. Our review unit occasionally finished up to 7% behind its predecessor, but this is probably because of the latter’s more powerful GPU. Overall, the H980 performed on par with the average of Core i7-8750H and Quadro P3200 equipped devices that we have already tested. 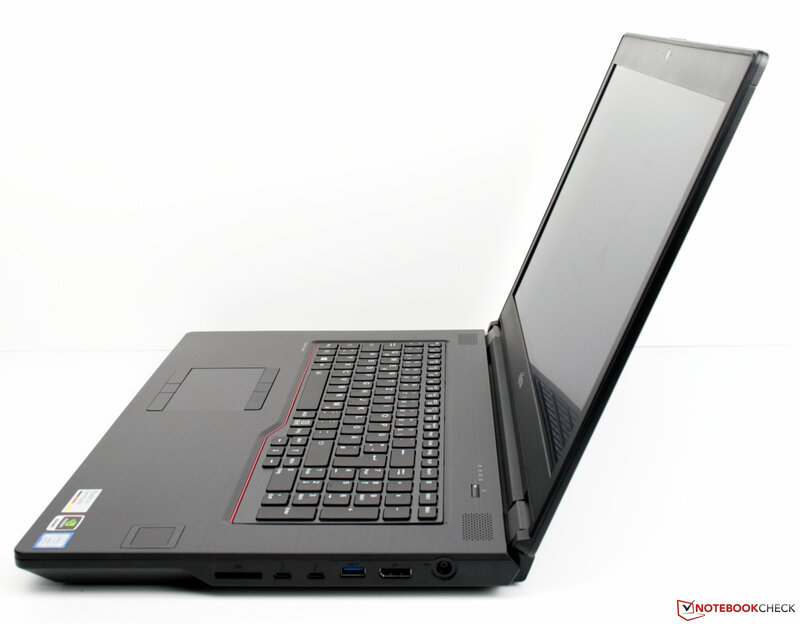 Moreover, the gap between our test device and our other comparison devices is generally small, although the Eurocom Tornado F7W flexes its muscles with its more powerful CPU and GPU. We should also point out that we noticed no performance dips or any abnormalities during our tests. 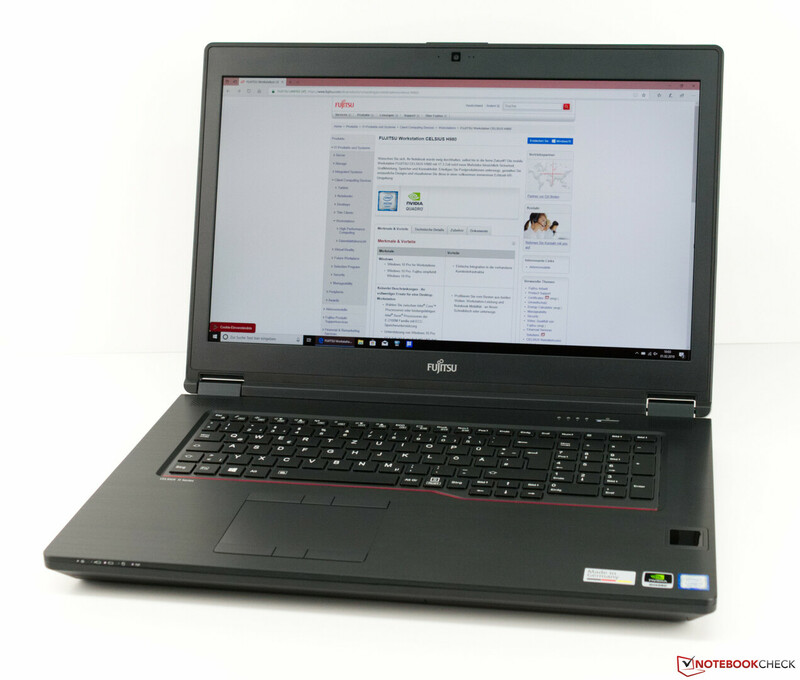 The system remained stable and felt fast throughout, which is also partially because of the NVMe SSD with which Fujitsu has equipped our review unit. 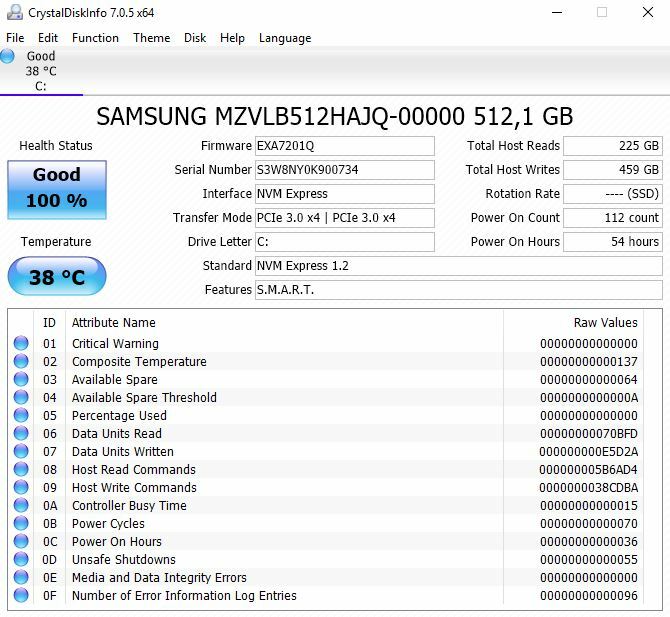 The Japanese manufacturer has equipped our review unit with a 512 GB Samsung PM981 SSD, which is one of the fastest NVMe drives on the market. 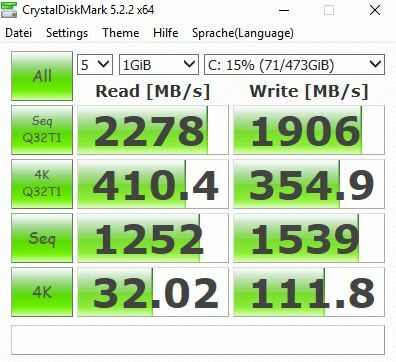 The drive has excellent write speeds, albeit it is beaten by the Samsung SM961 in the H970. 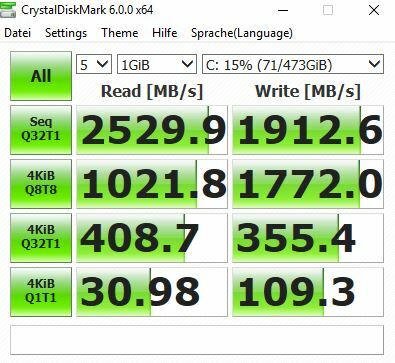 The PM981 also achieved impressive 4K read speeds in our AS SSD and CrystalDiskMark 5.2/6 tests, which indicate that the SSD should launch programs quickly. The H980 has a spare M.2 drive bay and two 2.5-inch drive bays, as we have mentioned earlier in this review. Please note that Fujitsu does not supply a 2.5-inch drive bay cable, so you must source one separately. 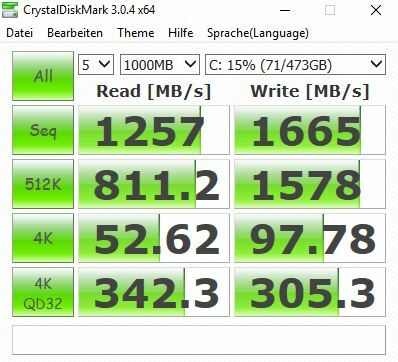 Please see our SSD and HDD benchmarks page for more comparison and information about various drives. 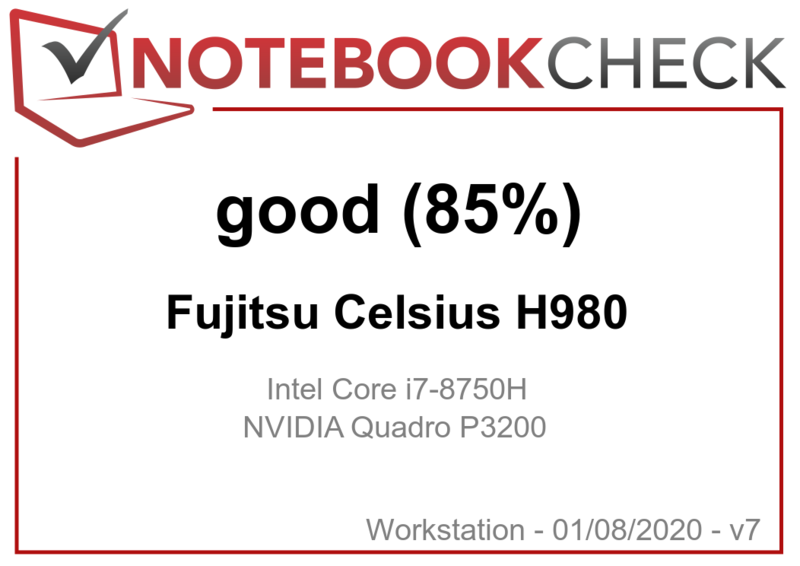 As befits a real workstation, Fujitsu has equipped our review unit with an NVIDIA Quadro P3200, which is a Pascal generation GPU. 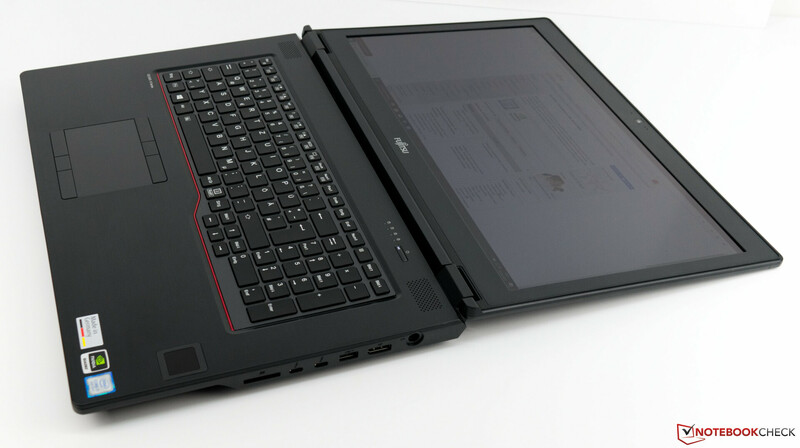 The P3200 has a 1,328 MHz base clock speed and can boost up to 1,543 MHz when required. 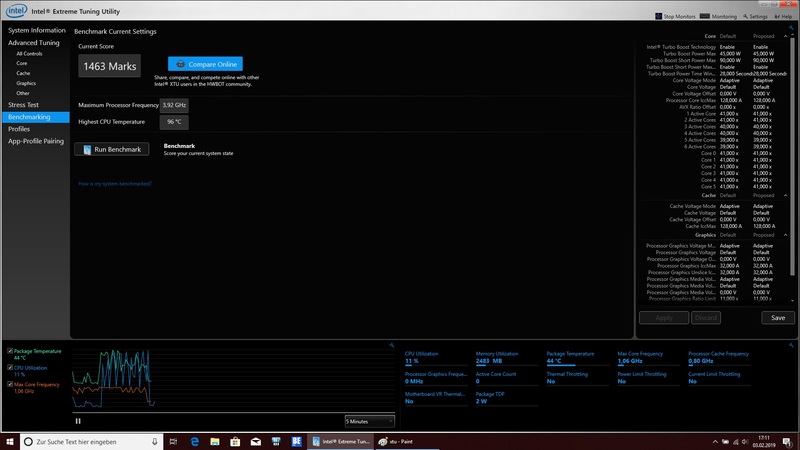 The GPU also has 6 GB of GDDR5 VRAM that operates at 7,000 MHz. 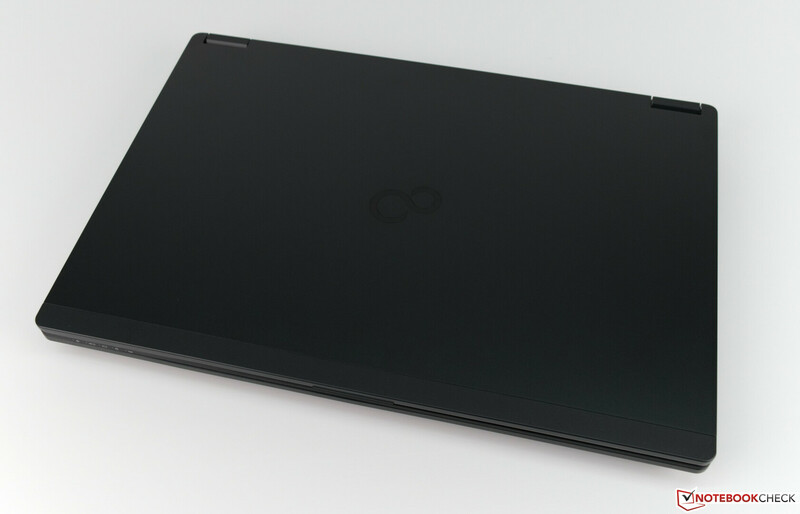 Our test device performed on par with the ThinkPad P72 in synthetic GPU benchmarks, which also has a Quadro P3200. It is also equipped with the slightly more powerful Core i7-8850H processor. The H980 almost always performed above the GPU average for the Quadro P3200 in synthetic benchmarks too. 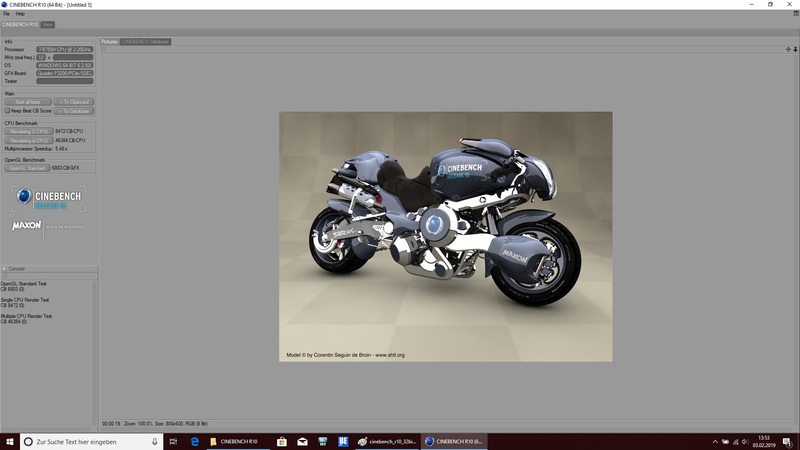 The Quadro P3200 has a 75 W TDP, but there is also Intel UHD Graphics 630, which handles 2D graphics and helps improve battery life. The UHD Graphics 630 is integrated within the Core i7-8750H and supports modern codecs such as H.265/HEVC and VP9, which allows the iGPU to decode high-resolution video and relieve pressure on the GPU natively. 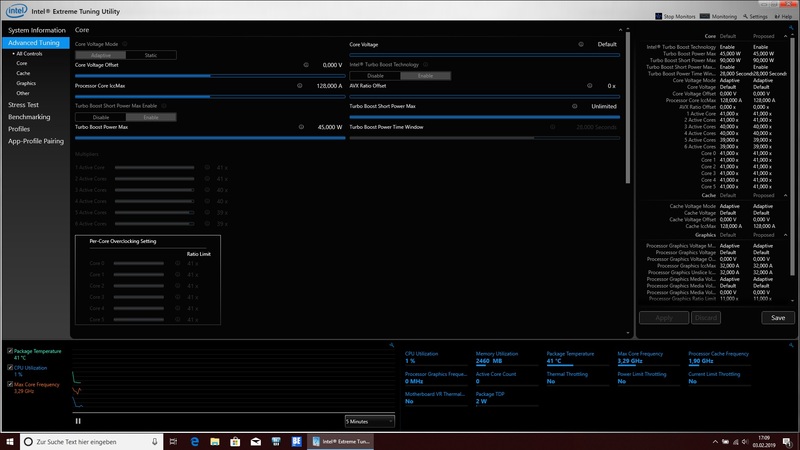 The H980 also supports NVIDIA Optimus, which allows the workstation to switch seamlessly between GPUs when required. Please see our GPU benchmarks page for more information on the UHD Graphics 630 and how it compares against other GPUs. 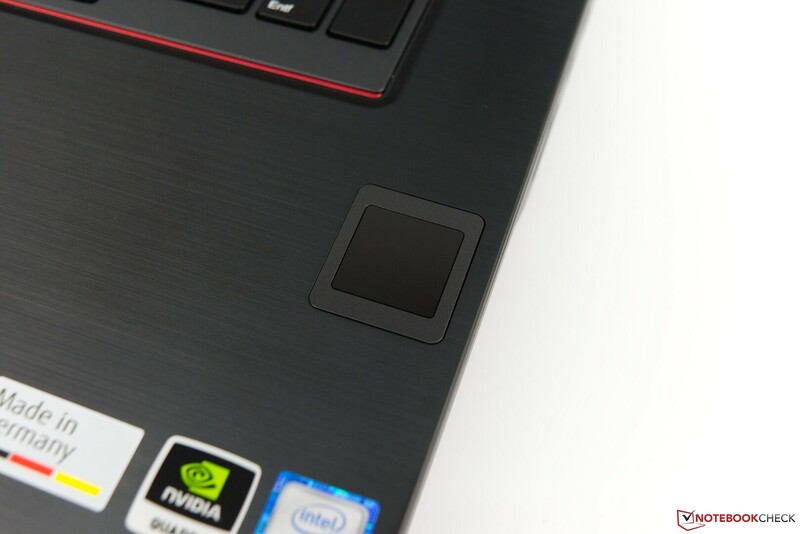 Historically, workstations have been poor gaming machines, but the advent of modern drivers mean that you can play most modern triple-A games on the H980 even at maximum graphics settings. Almost $4,500 would also get you an excellent gaming laptop, but we tested some games on our review unit anyway just to prove its gaming capabilities. The H980 handled all the games we tested with ease, while the Quadro P3200 sits directly between a GeForce GTX 1060 and a GeForce GTX 1070. Please note that the framerates table below were at 1080p; the H980 will struggle to play games in 4K at high graphics though.